During the 1950s, many Monroe residents liked to go to the Pollyanna Cafe. Shirley Frye and her young daughter made their way there one day and met the man who would change their lives. Once inside the cafe, Shirley's daughter wasted no time in finding Ron Reid. "She liked the looks of him and she crawled up in his lap," Shirley said. "He let her drink his soda." Before she knew what was happening, Shirley found herself talking to Ron. She thought he was cute. "He was a redhead," Shirley said. When they started dating, Ron and Shirley went on picnics with friends. They liked to play card games such as canasta. They listened to songs on the jukebox in the cafe where they met. Ron and Shirley particularly liked "Four Walls" by Jim Reeves. "We were just gabbing and gabbing and gabbing," Shirley said. "The next thing you know we were going out and we got married." Ron and Shirley Reid of Monroe will celebrate their 50th wedding anniversary Thursday, a date that this year falls on Thanksgiving Day. 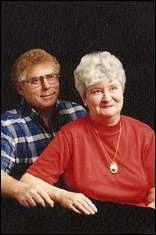 The couple were married Nov. 22, 1957, at The Minister of the Gospel in Everett. Ron worked for Snohomish County for almost two decades. He has lived in Monroe for 64 years. Shirley worked at Walt's Milk House between Snohomish and Monroe for four years in the 1970s. She went to work at Pharmasave in 1990 and stayed for seven years. Shirley has lived in Monroe for 52 years. The couple used to like to go to Reno but haven't been there in a while. Their family surprised them for their anniversary with a celebration at the Tulalip Casino. Ron and Shirley have three children, four grandchildren and eight great-grandchildren. Shirley's advice to those just starting out is to be very tolerant. She laughs at her granddaughters, who told her they didn't know if they could stay with one person as long as 50 years. Ron and Shirley don't share similar interests, but that is part of what keeps their relationship a good partnership. "We don't do that much together. He has his interests and I have mine," Shirley said. Ron goes hunting every year. It's been more than 50 years and he's yet to get his first elk. Shirley worries he may someday accomplish this feat. "I'm afraid he's going to get a heart attack because of the shock," she said, chuckling. Shirley collects thimbles and has more than 100 mouse magnets on her refrigerator. She also enjoys collecting mouse figurines and DVDs, of which she has more than 1,000. Shirley describes Ron as a good father to their children and agrees that love gets stronger as the years go on. She can't put into words what Ron means to her, how much she loves him. She considers herself a lucky woman. "He's bull-headed," Shirley said. "He's the same as me."